For the fifth consecutive year, Tulemar Beach has received the prestigious Blue Flag award for water quality and other ecological criteria from the National Blue Flag Commission. Located in Costa Rica's central pacific coastal town of Manuel Antonio, the beach provides a unique experience for residents and visitors of the residential resort community of Tulemar. The entire association of vacation rental home owners and residents work diligently to maintain a clean and sustainable beach environment. Tulemar's residents come from not only Costa Rica, but Nicaragua, the Netherlands, Canada, the UK and the US, representing a diverse group of people sharing the same commitment. Established in 1996 with the cooperation of community business leaders and governmental agencies, the Blue Flag Program was founded with the goal of improving education and awareness about the environment. It evaluates the beaches according to the water quality of the ocean and the drinking water, sanitary facilities, waste disposal, tourist safety, participation in environmental education in schools, and community involvement in beach maintenance. "There's a lot of work and planning involved," says Dave Houck, owner of Tulemar Vacation Home Rentals, located within Tulemar. "You have to get a score of 90% in all the categories to win the award. It's really important that we work with the program to ensure that we maintain a clean and sustainable environment for our residents and vacation rental visitors. 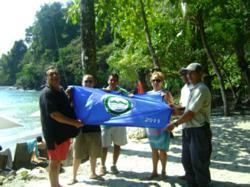 It's something that helps keep Tulemar at the top of popular destinations in Costa Rica." In addition to the annual evaluation, beach communities are monitored every month to make sure they're in compliance with the program. Participation has increased steadily since the program's launch. The success has allowed the program to be extended to include non-coastal communities as well, providing a direct and appreciable reward for efforts to preserve the ecology.